« TND – July 29th . . . . Or Are You Going to Scarborough Fair? A couple of weeks ago I fell down a rabbit hole when I tried to reverse engineer corn pudding for my mother using actual ingredients (as opposed to Jiffy corn muffin mix and cans of creamed corn). Finding a recipe hack for Jiffy corn muffin mix was very easy. Finding a hack for canned creamed corn was both harder, and more interesting. I started by looking up the ingredients in a can of creamed corn, assuming that I would find a laundry list of strange chemicals needed to make a dairy based product shelf stable. What I discovered is that canned creamed corn is nothing more than corn, water, a little sugar, and (depending on what brand you use) a little cornstarch. While recipes for homemade creamed corn usually have you cooking down several cups of heavy cream with your corn, canned creamed corn relies on pureed corn to form the creamy suspension for the whole kernals of corn. Unlike most traditional homemade creamed corns, canned cream corn is therefore both vegan and not any worse for you than just plain old corn eaten off the cob. I was so bemused by this discovery that I emailed everyone I could think of who would be remotely interested in this discovery. They were all gratifyingly fascinated and surprised. Having determined that canned creamed corn was vegan I started looking for vegan creamed corn recipes for my mother to use as the base for her creamed corn component to corn pudding. I had a hard time finding a recipe stripped down enough to work for the corn pudding – I think because most people figure if you’re going to go to the trouble of making creamed corn from scratch you might as well indulge a little – but along the way I came across a lot of vegan recipes for creamed corn that substituted coconut milk for the traditional heavy cream. That wasn’t a solution that worked for corn pudding, but it sounded like a genius idea and I immediately started plotting a menu around coconut creamed corn. That week was this week, and it is exactly as good as it sounds like it will be. I did, incidentally, eventually find a solution for canned creamed corn, and according to my mother her reverse engineered corn pudding turned out pretty much like the original recipe. I can’t say that her success is going to inspire me to stop using Jiffy corn muffin mix and canned creamed corn, but if you live somewhere you can’t get hold of such products, or you want to eschew preservatives these hacks will work. 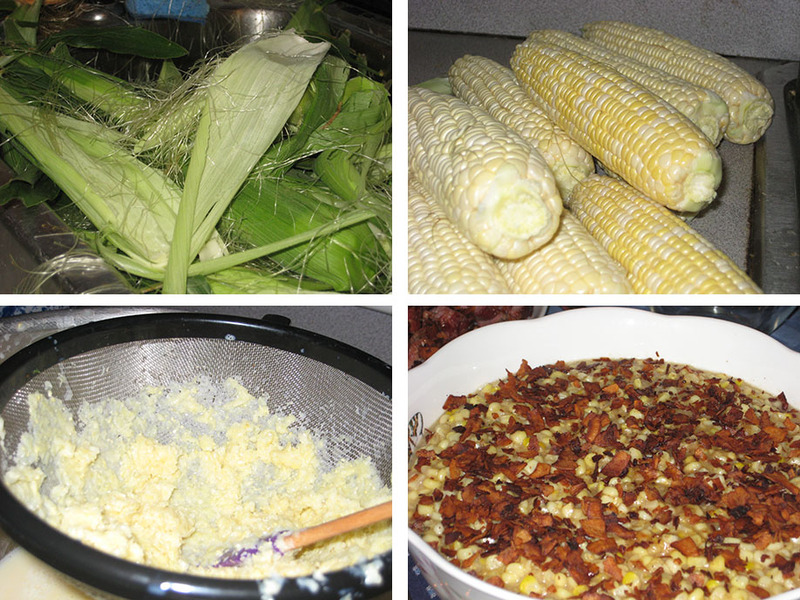 And, you could make multiple batches of each and keep them in the freezer for easy future corn pudding needs. Puree all the ingredients (except the pork). Add the pork to the marinade. Marinate overnight in the fridge. Remove from the marinade and place on a lightly oiled rack placed on a baking sheet (I recommend lining the baking sheet with tin foil for easy clean up). Roast until the pork has an internal temperature of 145 (about 30 minutes). Remove from the oven and allow to rest for 10 minutes before slicing. While the pork is roasting transfer the marinade to a saucepan and bring to a boil. Boil until the sauce has reduced by about half (15-20 minutes). Serve the sliced pork with the sauce on the side. Cut the kernels off of 4 ears of corn, and then run the flat side of a (dull) knife down the cobs to ‘milk’ them. Puree the kernels and liquid with ¼ cup of water. Force through a strainer, and discard the fibrous bits that are left in the strainer. Transfer the strained liquid to a non-stick skillet (the non-stick bit is important) and cook over a very low heat for about 5-10 minutes, stirring occasionally until the mixture has thickened and reduced. Reserve. You can make this the night before and refrigerate. Cut the kernels from the remaining 9 ears of corn, and ‘milk’ the cobs as above. In a large pan sweat the onion, garlic, lemongrass and sage in a little butter – you want the onion to soften, but not brown. Add the corn kernels, reserved corn cream, coconut milk, and sugar. Bring to a brisk simmer, and cook, stirring occasionally, for 15-20 minutes, or until the mixture has thickened, reduced, and generally envelops the corn in a creamy luxurious sauce. Season to taste with salt/pepper. Serve garnished with coconut ‘bacon’ (entirely optional). I ran across this recipe about a year ago and have been desperately curious about it ever since. This is not – contrary to what anyone in my office may believe – because I’m vegan, flirting with veganism, or even know all that many vegans, but because I suffer from culinary curiosity. Having now made it, I think it only tastes like bacon if you’ve never had bacon before. It is, however, quite tasty on its own merits, and as a garnish for something with coconut in it already it pairs nicely with the theme, and add a nice textural and decorative element to the creamed corn. Preheat oven to 325 and line a baking sheet with parchment. Combine all seasonings and then add the flaked coconut and stir to coat evenly. Spread out into an even layer on the baking sheet. Bake for 15-20 minutes, stirring the coconut every 5 minutes and keeping an eagle eye on it because it will go from browned to burned in nothing flat. Remove from oven and allow to cool.